Next time you’re craving a McDonald’s specialty McCafe drink, you may not actually have to hit the drive-thru. The fast-food giant is getting ready to release their popular McCafe drinks in bottled form to supermarkets and other stores. Fans of the frappe will look forward to stocking their fridge with the cold McCafe coffee. McDonald’s move to start selling their signature McCafe Frappes at your local grocery store proves that they’re ready to compete with serious coffee brands that already sell their beverages this way- think Starbucks and Dunkin’ Donuts. ABC News reports how McDonald’s has partnered with Coca-Cola to sell their frappes on supermarket shelves. Perhaps McDonald’s is learning that the popularity of their McCafe ground and whole beans that are already being sold in stores is a clue that cold bottled coffees will fly off the shelves. What was once thought of as a place to eat a burger and drink a soda is now giving off a definite coffee house vibe. And the McCafe brand will only expand from here as they get ready to roll out new espresso drinks in their restaurant next year like cappuccino and caramel macchiato. What do you think of McCafe drinks offered in supermarkets? 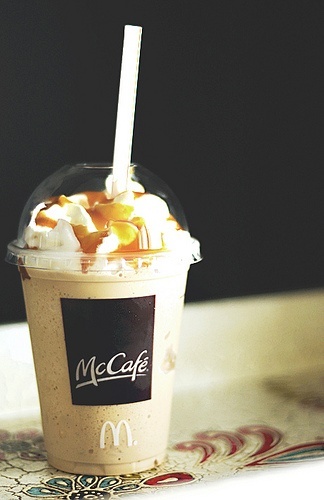 Would you try a bottled McCafe Frappe? Although I am partial to Starbucks since 1996, I am actually excited about these frappes coming to our stores. 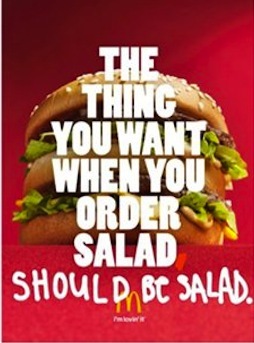 Good for McDonald's.